Letter from Dorothy to Arthur Linke (Dad) dated May 24, 1963. Arthur died June 3, 1963. Earl Girard was hired by the WPA in the mid to late 1930s to write histories of the Alpena area. This is his history of the U.S. Federal Building in Alpena, Michigan. Mud Lake Railroad Junction - Engineer's Log, 1888. 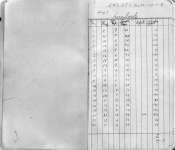 Mud Lake Railroad Engineer's Logbook - record of trains by engine number and signed by the Engineer. These trains ran on Russell Alger's logging railroad. This was located on George Gagnon's farm on Summers Road, in Hawes Township, Alcona County, Michigan. 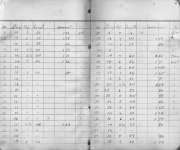 American Cedar Company with Henry K. Gustin account ledger showing the record of cedar cut and company expenses. Records of Henry K. Gustin for Cloverdale Lands providing locations and types of timber cut and by whom. 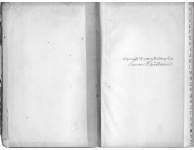 Account Book of Henry K. Gustin providing record of expenses of land and timber business. Huron Land Company with Henry K. Gustin providing record of land bought and sold. J.A. 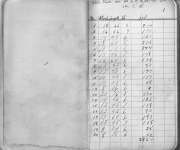 Widner with Henry K. Gustin account book providing expenses in timber business. Henry K. Gustin's record of land and timber purchases. Henry K. Gustin's record of location and type of timber cut. Rich Mathew's record for Henry K. Gustin of timber cut. Log mark or marks for Eales Brothers and Co. in Alpena, Michigan, 1898. Log mark or marks for S. F. Smith in Alpena, Michigan, 1887. Log mark or marks for Huron Handle and Lumber Co. in Alpena, Michigan, 1899 & 1911. Log mark or marks for Vrooman and Thompson in Alpena, Michigan, 1893,1894.